Well, we have arrived in 2017, y’all! I’m excited for the new year, as I am every January. I don’t have anything in particular that I know will happen this year – but I have hopes for lots of good things! To that end, I’ve launched a new Instagram account, dedicated solely to all things fashion. I’ve long thought hashtagging my way to a wider audience was the best method of growth for me, but I didn’t want to annoy other friends who aren’t as interested in that aspect of my life. Now, I don’t have to worry about irritating those people, while I can also focus on meeting more insta friends who share my interests! So, if you’re in the not-likely-to-be-annoyed category (as you probably are, if you’re reading this), please feel free to add me: Tastefully Trendy. Should be pretty easy to remember. Now, to the matter at hand. New Year’s Eve! In my adult life, NYE has become one of my favorite holidays – in part, because it is such an optimistic night. In full reality, because I get to wear sequins. This year, I couldn’t find ANYTHING shiny in stores. I guess I waited too late and all the sparkles sold out. So, I was forced to wear one of the three sequin skirts I already owned…and I actually was very pleased with the result. Off-the-shoulder: check. Choker: check. Cute furry hot pink clutch (that’s actually an Ipsy makeup bag): check. And of course, sequins and shiny shoes: check and check!! 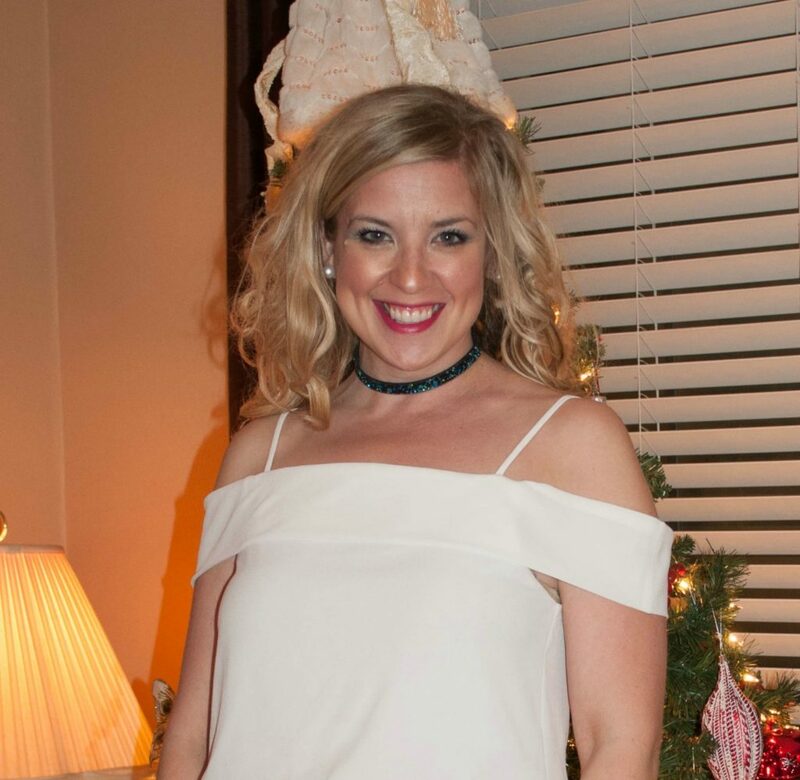 Here’s a close-up of the off-the-shoulder detail (and my makeup! My secret is great highlighter and NYX’s matte setting spray!). And the rest of the outfit (sans ring, because I forgot to take a picture of that). Sadly, one of those cute pearl earrings were a casualty of the evening. I somehow still had the back, but the pearl itself was nowhere to be seen (insert sobbing emoji). Oh well. On a happier note, can we talk about how good my new camera is? I mean, look at those silver shoes sparkle! Did you all have a good New Year’s Eve? Any fun plans? My party was Y2K themed, so you know it was amazing. I hope yours was, too, and that it sparkled and shined with all the magic and promise of a new year! 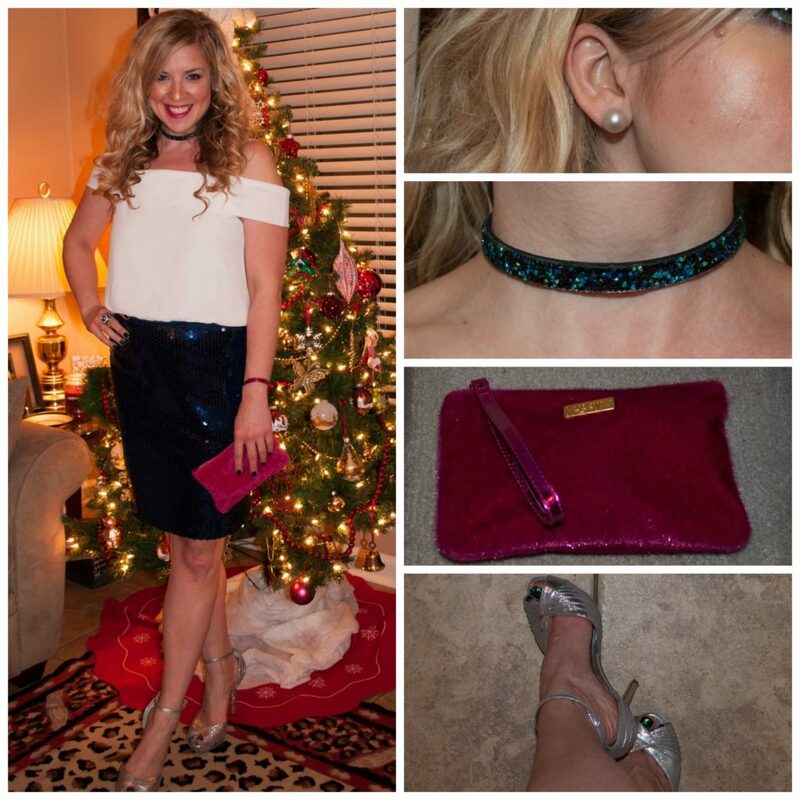 Send me your outfit pictures – I’d love to see your shimmer!